I made some money in my high school and college days as a baker for a local supermarket chain. Most of the skills I learned don’t help too much in the small kitchen baking I may attempt today. I don’t have 50 lb. bags of muffin mix at my fingertips, nor do I have industrial ovens and partially baked, preformed breads. But one interesting item we used to make in the bakery was the hermit cookie. It was similar to gingerbread in rectangular cookie form with raisins, but what made it special was the “extras” we added. When cakes and pies expired they were often reincarnated as hermit ingredients and it wasn’t uncommon for me to dump whole cakes into the industrial mixer along with the hermit mix. With a greater increase in allergy concerns today I’m not sure if this is still practiced. However, if it is I’m sure it comes with a warning label to highlight the surprise additions; Warning: contents may contain anything in reach of an unsupervised 16 year old. Here’s what the ingredients looked like before being incorporated. 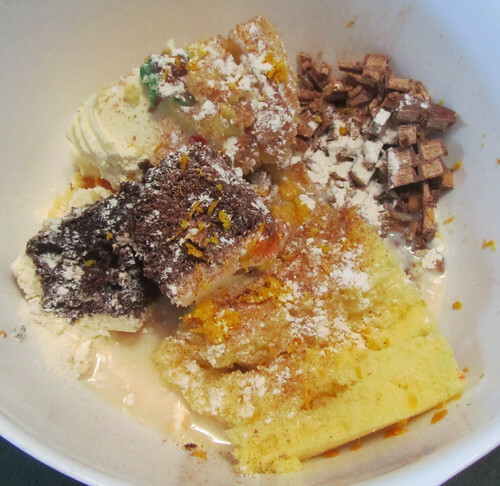 As you could guess, it took us every bit of self-control not to just eat the mixture in its current state. 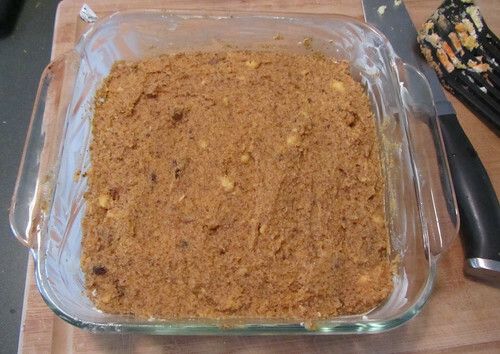 After mixing I poured the “batter” into a buttered 8×8″ pan and baked for about 20 minutes at 350. The below photo is what it looked like before baking, but the result after baking was virtually identical. So how did it turn out? Well it wasn’t bad, but I don’t think I’ll make the wikipedia page for famous inventors which was my original intent. The end result reminded me of bread pudding and served with ice cream would probably have been passable at a restaurant. Did my wife eat her words? No. Did she eat the Pumpkin Hermit Pudding. Also No. 2For historical record-keeping only. Do not replicate. 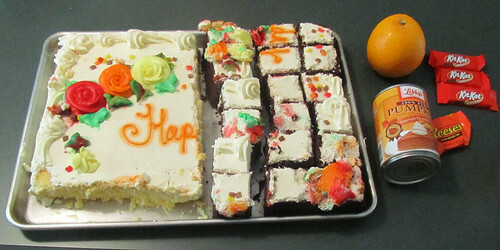 Glad you found some use for that huge cake – you are such an “experimenter” with food. Remember the shrimp with baked beans on the Cape.